Episode 51: That’s Mistress Dork, to you. This week I spent way too much time playing with fiber. No, wait. Is there such a thing as too much time spent on fiber? I’m hoping yarn will distract from the relative brevity of the podcast this week. For longer podcasts, you know what to do. Special thanks to contributor Suzie, for her essay this week, and to Sage Tyrtle, of the Quirky Nomads Podcast, for reading it. My yarn is cursed. (No, not this yarn. The OTHER yarn.) Should I do this with it? Or this? It takes a while to get into Ravelry, but it will be worth the wait, I promise. Get yourself on the waiting list, the site will be open soon, and I will see you there. Welcome back to podcasting, Marie. Additional music performed by Douglas Spotted Eagle. I vote for the Bad JuJu pattern for the yarn. That is what cursed yarn deserves! I owe Pam one too. I’ve been meaning to donate ever since I’ve been taking you on my walks, however, once I get back in the house I get rather distracted. This morning I vowed to finally pay my therapist (you) for all the hours you’ve put in. Thanks again and I look forward to our next session. I’m sorry to post a practical question here, but I’m being rather dense and can’t seem to find the answer here or over on your blog. I’d like to submit a bit of writing. I’ve read the submission guidelines, and found everything I need to know except WHERE to actually send it. Please point me to the address (that is probably lit up with bold letters and the web-equivalent of flashing red lights) where you accept such things. Thanks much! Wonderful episode as always, Brenda! The song ‘The way I am’ brought tears to my eyes. I’m listening to the show on this fine Saturday morning, still dressed in PJ’s. I’m moving around the house making coffee, cleaning, and knitting pink socks. It really does not get any better than this. Thank you! I have just learned about ipods and podcasts. My son gave me his hand me down shuffle. I have 10 children and work in a bridal shop in California. I steam wedding dresses and work by myself most of the day. I have cried about this job and have applied for millions of other jobs. But listening to your podcasts has improved my quality of life a 100 percent. I knit every spare minute I have. I plan to donate on payday. I owe so much to you for making very LONG days at work doable. I love your podcast, which I only discovered recently. It’s worth supporting. Absolutely top tier. Regarding the sock pattern–giving it as a gift to contributors does sound like the right thing to do, but I think after the series is over you should not give it free (why should procrastinators benefit?) At that point, you should actually charge for it. C’mon–you’re worth it. And so, presumably is the pattern. Why else would we be clamoring for it? I just left you a little note over on Ravelry. I think you need some S’mores roving from me…..
i have to say an extra thanks, Brenda – your podcast actually makes it POSSIBLE for me to knit and be healthy! after working all day long, when i get home, all i want to do is pursue my extra-vocational activities, and they are all pretty physically quiet (knitting, sewing, tending to the educational fund i’ve started). Since i figured out how to get your podcasts on my mp3 player, I have started walking to work and ENJOYING every step of the way. My walk is about the length of one podcast! i think your sock pattern solution (and Pam’s!) is genius, and an excellent motivator for those of us who are simply lazy about making donations! i was a girl scout from age 5-16, and thoroughly enjoyed your campfire girl essay. i am so excited to jump in and earn my beads this summer! Loved this latest episode! Hope your sis is doing better every day! The scouting and camp were such a great idea for a series!Are you going to mention the Art Scouts soon? Think I’m now finally up to date with the back episodes. In the scouting theme I remember when I was a guide there being a conservation badge and with that in mind I’d like to draw your attention to a very good cause. The marine conservation society are campaigning for more marine reserves please check out their website and if you agree mention it on your podcast they need the support. Closer to your home the Skomer Marine Nature Reserve in Pembroke is one of the few marine reserves in the country but it is a voluntary “no take” zone the staff at the reserve are campaigning to get it made a full no take zone again check out the on line petition at West Wales Marine Conservation and give them a mention. Thanks for a great show and sorry I shamelessly hijacked your comments. Hey lovely! It’s great to be back!! 1. I donated but not enough for the pure joy I get. gotta go pump some funds in the donation box. 2. I love my sister too but hated her until she turned 23. 3. I vote for the scarf, it’s prettier than mean dolls. 4. I bought a ticket to The Ditty Bops who are coming to DC in Sept. ..$19.50..get out of here! 5. I grew up in Portland and was the Oregon State Fair Reserve Champion Knitter in 1959. 7. I was a Brownie when Camp fire was cooler. You must really love Ingrid!! I found out about her just a few weeks before you started playing her on your show. She had amazing talent. I haven’t listened to the current episode, but I’m sure it’s not “too long”. Thanks for all you do!!! Hi, Brenda! I think you should offer the sock pattern as a thank-you to donors during and beyond this series. There will be a certain number of folks coming by to just snag the pattern… even if they donate a dollar, that will help Cast-On continue. Thanks again for all your hard work on the podcast! Great series idea, loved the fishing essay, looking forward to seeing what comes up next! Didn’t get to listen to your latest, but I did read about Annie Modesett and wanted to help her. Knowing that you reach a wide audience, I thought I’d ask you to mention it in your podcast or blog. The dress is really hot — love the tailoring. Thanks so much for your podcast. I just started listening to knitting podcasts and everyone said I HAD to listen to Cast On. Having listened to half a dozen episodes I have to agree. I am starting from the beginning and have just finished Episode 5 in which you talk about sock yarns and the difficulty you have finding nice, non-stripey yarns. I have just started a hand painted yarn business, The Painted Sheep, and would LOVE to send you a skein of sock yarn. Though I will be offering self-striping yarn, I personally prefer more subtle colorways. I think I might have some stuff you would like. If you have a minute take a look at my website (still a work in progress, but lots of pictures are already up) and let me know if there is anything you would like to knit with. I want to make a submission and I must have just exhausted what little is left of my brain because I don’t see an email addy or a place for it to go. Please take pity on me and let me know? Thanks. LOVE LOVE LOVE the podcast! Love the podcast! I’ve been catching up on all the back episodes and lovin’ ’em. Hey Brenda. I love your podcast! Your podcast was the first of any podcasts that I ever downloaded and I’ve downloaded several on several topics. Thank you for your hard work. After all of this time, I’ll make my first donation today. Sorry for the delay. I think you should make the chevron scarf with your hand-dyed. You seemed pretty enthusiastic about finding the pattern. Whether you gift it or keep it for yourself, it will be a more fitting project for such beautiful yarn. I’ve really enjoyed listening to your podcasts. There are people who use the same yarn over and over. I’m one of them. Not only can’t I afford other makes, I don’t have a credit card, so even if I could, I wouldn’t be able to order anything. I’m sure I’m not the only one. Right now I’m knitting socks for a friend’s daughter and she bought the yarn. And the yarn for her socks and her husband’s. Three different colours, three different styles of socks. Not repetitious at all! Have a nice summer. Unlike the notorious Boy Scouts, the Girls Scouts have never discriminated against lesbians and gays! Dear Brenda, just wanted to let you know I’ve been using your podcast for purposes other than those intended – to wit, non-knitting chores! It is my companion for laundry and gardening and, today after a particularly hard week, for my day job in the office. Buds in to keep the crazies out. Thank you so much for your lovely voice, creativity and for the incredible music – always the incredible music! Many thanks, have a great week. I’ve been listening to your podcast since late last year, catching up systematically from The Very Beginning (I have a thing about starting from the first book in a series, too). I really enjoy the variety of viewpoints and people you bring together, and my current absolute favourite time to listen to you on my iPod is when I’m doing the washing up! I dance around the kitchen oblivious to the children squabbling in the other room, finish the chore in a glow of virtue, then once the children are in bed, sit down to enjoy my actual knitting all the more for the long leadup. This museum is all about shearing and its history in Australia, and while the website doesn’t capture the experiences of the hands-on displays, there are plenty of snapshots of shearers, shearing, sheep and fleece. Time to get back to the kitchen! Love the podcast! I just recently got through all the back episodes, so I finally feel like I can comment! I’m so excited to hear Ingrid Michaelson on your pod cast, so gets play time on the radio station I listen to, but I’ve never heard “The Way I Am”- Love it! I love your podcast – your shows are what make it possible for me to tolerate air travel (and I must, for work) without hyperventilating and scaring fellow passengers with my white-knuckled armrest clutching. I love the camp theme this season, and unless I’m being too literal, though we could ‘earn badges’…? I misunderstood, then I am going to feel like a goober (close cousin to the dork), but if not… where can I find out how to earn badges (because I have an idea for a badge…)? Thank you and see you on ravelry! I’m a lifelong fan of the Red Sox, a team that was reputed to be under the “curse of the Bambino” until they finally did us proud a couple years ago by winning the World Series. So while I agree your skein (and several of mine) are cursed. That’s no reason to give up on them. You just have to do as the bumper stickers in Boston say and “Believe this is the year” (or “the project” as the case may be). As for stash decreasing, it’s incredibly satisfying. I sent a lot of the yarn well meaning family members had given me in colors that just weren’t me, to the house for women overcoming substance abuse that you mentioned in an earlier podcast. They sent me a wonderful letter and the whole experience, as well as the new found space in my apartment, felt great. Did you catch the podcast of This American Life (from NPR) a couple weeks back? It was on camping (and the boyscouts), so there was a lot of overlap with this series that I found amusing. I don’t think you’ve set up any expectation of a free sock pattern by talking about its creation online. I think it’s nice that you thought about that possibility, but as a listener, as long as you show pictures of the finished product I’d be satisfied. That being said, I love Pam’s idea and thuroughly agree with Mishka’s adaptation of it. Just a thought about sock patterns for ‘difficult’ hand-painted yarns: Nona’s ‘Sidewinders’ socks really show the colours well, and they’re a fascinating knit. I want a badge! Someone (wenders) mentioned badges. I never got many badges when i was a girlscout…I want some now!! I am another devoted listener and abiding member of the Saint Brenda convent. I have looked for a way to contact you via e-mail, but can’t find an address for you. Thus, I am leaving this in your comments section. Give it a listen, and if you care to suggest it to your listeners, I’d very much appreciate it! Thank you for playing The Ditty Bops. One of the girls of the amazing duo, Abby is from my hometown and she is the daughter of a friend. It was a huge surprise to hear them as I hadn’t checked this site before listening. Hahaha! You are right, they do put on a great show. Hopefully they will travel to your neck of the woods soon. My thoughts and prayers are with your sister. I’ve only recently started listening to your podcasts and I’m just loving them. As a former Campfire girl myself I really appreciated this particular episode. It brought back many, many wonderful memories. Now i need to go find my vest with all of it’s intricate beads. Hope your sister is soon on the mend and I look forward to your next podcast! I am so glad that you put links to the music artist websites. I just purchased 2 tickets to the Ditty Bops when they perform in Chicago at the end of August. I wouldn’t have done so if you hadn’t mentioned that they were going on tour. Thanks for keeping us informed on other tidbits beyond knitting. This was my first time listening to your ‘cast — and I LOVE it. After I got over my she-lives-in-the-U.K. envy. I’m totally a fan of anyone who puts music like this on their podcast, and who has a Cold Comfort Farm sock pattern. Amos would disapprove, I’m afraid – he’d think you were wasting this knitting time instead of quiverin’. Keep up the awesome work, oh Knittish Goddess! Dearest Brenda…I wish the American dollar was stronger in the UK, ’cause I would send more money. I would gladly pay for your Amos socks pattern but YOU can only decide how to handle that. It’s what you can live with. I just returned from London and I am finally drying out. Wimbledon was fun but very soggy. I have my brand new Cold Comfort Farm at my bedside to keep that lovely British feeling going strong. Thank you for the this episode. While I never made it from Bluebirds to Campfire Girls, I still learned some meaningful values. My yarn or fabric stashes are not big ’cause I do …”finish what I have begun”! I look forward…as everyone does…to your next podcast. I am a brand new knitter from Portland and I just wanted to tell you how much you have inspired me to get into knitting. Initially, I just thought I would learn simple stitches so that I could knit a blanket for my soon to be born niece. But, because of podcasts like yours, I am now beginning to understand all of the amazing things I can learn and incredible things I can make if I explore this craft. It is nice to know that I will have a trusted Rose City native as one of my guides. So, thank you for your tutelage, your candor, your courage, and your devotion to knitters like me. I have really enjoyed your podcasts. I got an Ipod so I could listen to music during labor. Well, once I learned about wonderful podcasts that is what I listened to. Your podcast on knitting memory is what I listened to while laboring for hours in the tub. After 2 days of labor, 2 hours of pushing and a c-section my daughter was finally born. You have no idea what a relief and comfort it was to have your podcasts to listen to during that time. Keep it coming! I have listened to your podcast from the beginning and everyone is special but this one goes in the record books as my husband took a photo of me as I listened……reason being he found it hilarious that I should listen to you talk about knitting whilst casting on my second sock on a nudist beach in Crete! (the photo was tasteful…no bits on show!…..and the look on my face is priceless as I am lost in your wonderful words and concentrating at the same time!!!) 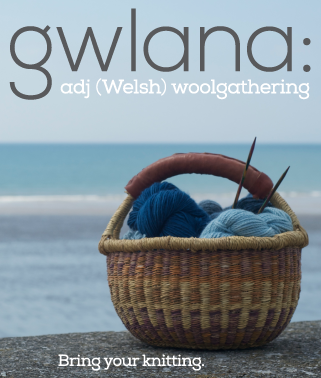 Wonder what strange places other people knit and listen in? Keep the podcasts coming ‘cos you are wonderful! I just want to tell you that I enjoy your podcast very much! I started listenening in February ’07, so I had a lot of catching up to do. I listened while driving to and from work and, let me tell you, it made Southern California traffic much more barable! I especially loved your essay “On Gauge”. Thank you for producing a wonderful product. I enjoy listening to it as much as you enjoy putting it together. Now that I’m caught up, I eagerly await the next episode! Hope all is well in the UK. As a new listener, that has now done the marathon listening in order to “catch up” I can say that your show has the consistently high quality that will keep me coming back. As what you should do with your uncooperative yarn, I tend to love the scarf myself. The voodoo doll really does look best in black, so unless you want to overdye your yarn the scarf is probably best. I am wondering if you can give some tips on facing the fear of sock knitting. I have ordered several great sock yarns, and have purchased a few more from our local yarn shop here, but am really frightened to start! Do I do double pointed needles or the “new” socks on two circular needles? Please give some basic beginning tips for sock success. I have done sweaters, afgans, hats, etc. Why are the socks so darn frightening??? Is the sock pattern you talk about one you would recommend for a sock virgin? Thank you for your podcast and good health to you and your family. I dunno why I was just thinking about this but I remembered you asking for music ideas… anyway I wanted to mention John Conahan, who was my high school chorus teacher and also a great jazz/rock pianist and vocalist. I checked, and he’s Podsafe (the John Conahan Group). I especially like The Same and High Tide. Hi Brenda. Thanks for producing such a great podcast! I’m so glad that hubby got me an Ipod for Christmas, and so glad that I found your podcast! I just finished listening to this episode, and was wondering where do I find out about earning beads? I was a Girl Guide for a few years when I was a kid, and loved it! Following your podcast about the Brother Amos socks I decided to read COLD COMFORT FARM. Read it in two days as I couldn’t put it down – what a funny book particularly the scene where brother goes to talk to the quivering brethren! 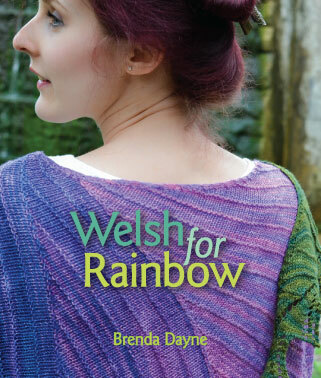 So not only are you a good source of knitting know how you are inspiring your listeners to pick up books as well. Keep up the good work. The sad thing is I have finally finished listening to the back catalogue of your podcasts. They kept me going when I trained for the moonwalk this year. Please download a new one soon!!! Brenda I really adore your podcast. It’s so therapeutic to listen to when I’m working! I just ordered a load of Debbie Bliss wool to make some slippers with, I’m travelling to Brussels (from England) in a few days on the eurostar so that will give me lots and lots of knitting time. I love your podcasts! And you’re so lovely! I heard news that Wales has been having really bad flooding. I hope you haven’t been affected by it. I have just discovered your podcast, and am busily trying to catch up on all of the back issues! I am currently militarily deployed to Guam, and really enjoyed listening to Episodes 1.5 and 2 while surrounded by palm trees and 90 degree weather. Tired of Christmas music? Not at all! What a joy to listen to as I continue to work on Arwen’s Cardigan from last winter’s Interweave Knits (it thrills me every time I turn the cable part over and it looks just as good on the “wrong” side! Amazing!). THANKS for the company as I sit and knit- I am definitely a knitting expatriate down here!